Last week we reported that prices were up in March over last year’s numbers and listings were down, but that doesn’t tell the whole story. This article won’t tell the whole story either as no one article could, however we would like to dig a little deeper and explain some factors influencing the market. Over the years foreclosures and short sales weighed down the market, and in fact prices became artificially too low as homes were selling well below replacement cost. This has impacted builders not being able to build until recently. Prices have risen such that some home builders are able to build again. As you can see from the graph, traditional sales picked up 8.2% while foreclosures fell 34.5% and short sales fell 45.1% This has led to an increase in prices as the artificial factors influencing prices to the down side are drying up. 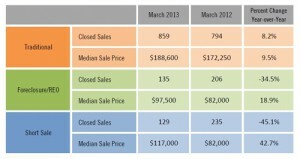 Median sale prices for traditional sales are up 9.5% over March 2012 numbers and foreclosure prices are up 18.9%. Both pale in comparison to the 42.7% increase in the media sale price of a short sale. You can see the downward pricing pressure has abated, and the rising tide is lifting all boats, even distressed sales. If we dig deeper and look at closed sales by price range you’ll quickly notice homes priced under $100,000 are down sharply. That’s not because there isn’t demand but rather limited supply as prices have outgrown this category. You’ll probably notice the biggest winner is the $250,000-$300,000 category as sales jumped 43.7% in this range alone. 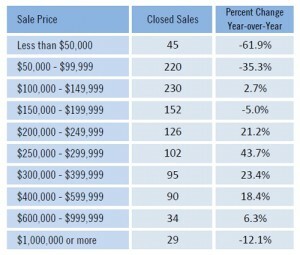 Sales are down in the $150,000-$200,000 range simply because it’s getting harder to find those homes on the market. Most of these same homes have graduated into the over $200,000 range from last year. Most all price ranges saw increases except for the over $1 Million category. Even though the overall market is improving, the overall economy remains a drag on expensive luxury homes. There is still a market, but not a market in which to over-price. All price ranges are sensitive, and the $ 1 Million+ market is no exception. We would expect to see some increases in the over $1 Million range going forward. Typically activity increases the first half of the year and data is only month by month through March. April may turn in some really good numbers too. Many sales occur through Easter and Easter was early this year. Visitors seemed to remain heavy at the beaches and Sanibel and Captiva even after the heavy selling season. This could bode well for tourism dollars and help local residents who run businesses here. In April, May and June we’ll see the final results of those February and March sales, so stay tuned. Listing calls are picking back up again, at least here at the Ellis Team. Inventory is down so now is a good time to sell even if we don’t have as many visitors here looking today as we did a few months ago. Many may come back in the summer and complete a purchase because their interest was piqued back in season. Today the Hertz Corporation announced it is relocating its world headquarters to Lee County Florida which will bring over 700 jobs to SW Florida at an average wage of $102,000. This will help an already improving real estate market in the Fort Myers, Cape Coral, Bonita Springs, Estero real estate markets. Posted in Cape Coral, Cape Coral Real Estate, Fort Myers Real Estate, Southwest Florida Real Estate.Tagged Ellis Team at RE/MAX Realty Group, Estero home sales, Estero price range, Fort Myers home prices, hertz, Hertz Corporation, Inside the SW Florida Real Estate Market Numbers, May 2013 real estate market update, RE/MAX Estero, RE/MAX South Fort Myers, relocation Estero.